MD & CEO of Manappuram Finance Ltd. Dancing your heart out till you feel like all your energy is drained from your body. he red tape has delayed Lakshmi Mittal to scrap dormant Rs. 40,000 crore project. ArcelorMittal, the world’s top steelmaker has stated that it would scrap a planned steel plant in Odisha due to delays in acquiring land and an iron ore mine, obstacles that have also caused South Korea’s POSCO to abandon plans. The decision to scrap the planned 12 million tons a year (MTA) plant in Odisha, comes a day after the world’s fifth biggest steelmaker, POSCO said that it was ditching a 6 MTA plant in Karnataka because of delays in receiving iron ore mining rights and opposition from residents which had held back land acquisition. The failed projects will be a blow to the central government, which has relaxed foreign investment rules to draw in the funds needed to turn around slowing economic growth and support a weak rupee. ajaj Auto chief Rajiv Bajaj has made the decision to reject labour union’s demand for allotment of employee stock options (Esop) but said the company management is ready to discuss the other issues which the union has come to raise including the reinstatement of suspended workers. The managing director Rajiv Bajaj told reporters in Pune that “the company will not agree to demand to allot shares to the employees even if stoppage of work goes on for 500 days, as even the top management has been allotted shares.” A company official has said that the production loss since June 25th has been around 30,000 units. “The allegations about ill-treatment of workers are nothing but laughable. Production and discipline has to be restored to normal before meaningful dialogue can take place,” said Mr. Bajaj. Sony has launched its biggest-ever smart phone, the Xperia Z Ultra, at a price point of Rs. 46,990. The phone will be available starting August 2, in Black, White and Purple colours. he Engineering and construction major Larsen & Toubro (L&T) has stated that it has won a Rs. 2,085 crore overseas order from the Oman government for construction of Al Batinah Expressway. In the statement the company has said that “the transportation infrastructure business of L&T has made a major breakthrough in its international business by bagging a new order worth riyal Omani 135.6 million (estimated to be Rs 2,085 crore) from the Ministry of Transport and Communications, Sultanate of Oman, for construction of the Al Batinah Expressway Package 4.” The project is scheduled to be completed in 36 months and it will be involving building a 50 km four lane dual carriage expressway with two grade separated interchanges, seven overpass, five bridges and cross drainage work as per the international standards. he drug major Sun Pharma has recalled numerous amounts of Nimodine capsules, a drug which is indicated to treat brain hemorrhage, in the U.S. market due to the crystal formation. As per the information available on the U.S. Food and Drug Administration website, the company has recalled the Nimodine 30 mg capsules due to “crystallization.” The recalls falls under Class 2 category, and it is done in a situation in which the use of or exposure to a violative product may cause temporary or medically reversible adverse health consequences or where the probability of serious adverse health consequences is remote. The recall has been initiated voluntarily by the drug maker and the same was intimated to the drug regulator through a letter on May 21.
oldman Sachs has come to announce that it will be selling a majority stake in it’s electronic trading software business, REDI, to a consortium of investors. Goldman Sachs will be retaining a significant minority stake in the business which is providing a platform to route orders to equities, futures and options. According to Goldman, the investor group buying the stake includes BofA Merrill Lynch, Barclays, BNP Paribas, Citadel and Lightyear Capital, Goldman. However he did not disclose the value of the deal. Rishi Nangalia, who had managed Goldman’s electronic trading business development group, has been appointed as REDI’s chief executive. he U.S. private equity giant Blackstone Group LP has agreed to buy a majority of stake in Indian auto parts maker Agile Electric Works, which controls Igarashi Motors, for about $100 million. Blackstone though declined to comment, while Agile was not immediately available for comment regarding this statement which was told to Reuters by two sources who are in direct knowledge with the matter at hand. The Indian investment bank Map Advisory Group is advising the seller, according to the sources. Blackstone is known for large buyout deals globally, and has previously made 16 private equity investments which totals up to $1.7 billion in India but only two of those were for a controlling stake, in a country where outright private equity buyouts are rare. The Agile deal with be Blackstone’s third acquisition. ermany’s SAP AG has trimmed its outlook for 2013 software revenue, blaming slowing economic growth in China. There are expectations of revenues from software and software related services to grow by 10 percent this year which is excluding the exchange rate fluctuations, when compared with a previous outlook for 11 to 13 percent growth. According to Co-Chief Executive Jim Hagemann Snabe, “In the short run, the reduced growth rates in China are impacting not just China but all the countries around it.” China’s slowly growing GDP comes as a setback for companies worldwide who are betting on a continued boom in the world’s second biggest economy. This includes companies in Japan, Australia and New Zealand who have become hesitant about investing in software, SAP’s. t seems that Etihad Airways is working towards meeting the deadline to win the regulatory approvals on its planned $379 million purchase of a stake in Jet Airways. In April Etihad, on its acquisition drive agreed to buy a 24 percent stake in Jet in a deal which would essentially provide India’s largest carrier with a deep pocketed global partner as well as cash to help pay off the debts. However the political concerns and scrutiny by the market regulators have caused a delay in the deal risking missing a “long stop” date, before which the regulatory approvals have to be secured. The deadline could be extended by the airlines but Etihad may also look to renegotiate terms of the deal according to an industry expert. oal India Ltd has signed a new supply agreement with NTPC Ltd who happens to be its top customer and the country’s largest power producer thus putting an end to months of disputes over fuel quality and payments. The move will lift the spectre of mass blackouts as well as a possible shelving of mine expansion and will the followed by the signing of the supply pacts to two power plants in eastern India, which was a issue at the hear of the dispute. Along with having signed FSA’s (Fuel supply agreements) with NTPC, Coal India’s chairman S. Narsing Rao has reportedly stated that in addition there would be eight more deals which would be signed in order to help generate about 4,000 megawatts of power. he South Korean steel giant Posco is most likely to start the work on the $12 bllion project at Jagatsinghpur as the transfer of the 2,700 acres to it will be completed soon.The Odisha Steel and Mines Minister Rajni Kant Signh told PTI that they “hope Posco will begin work on the project soon. The state government has completed the task of land acquisition for the first phase of the project and would be transferring the remaining about 1,000 acres of land to it soon.” A Posco official said that if everything goes as planned, the Phase 1 of the project might be commissioned in the year of 2018. Phase 2 would be completed three years after completion of Phase 1, while Phase 3 will be commissioned within three years after Phase 2.
he Pharmaceutical firm Wockhardt Ltd has stated that it has received a warning letter from the U.S. Health regulator over its facility at Waluj in Maharashtra not meeting the manufacturing norms. The company had announced earlier in May that the U.S. Food and Drug Administration (USFDA) had issued an import alert on its Waluj facility, which makes injectables and solid dosages. Wockhardt said that it has already initiated several corrective actions to resolve the same, adding that it is maintaining the implications of the import alert on the companyâ&#x20AC;&#x2122;s consolidated revenues to be in the range of $100 million on an annual basis. The company is continuing to cooperate with USFDA to resolve the issues at the earliest. ith more compliance officers in China than in any country bar the United States, the British drug maker GlaxoSmithKline Pic should be obviously in a well positioned manner to do things right. However despite conducting up to 20 internal audits a year in China, including an extensive 4-month probe earlier in 2013, the GSK bosses were blindsided by police allegation of massive corruption involving the travel agencies used to funnel bribes to doctors and officials. The scale of funds which were signed off by GSK to pay off the travel agencies for organizing the educational medical meetings has triggered heated debate, with some saying that such spending would have looked legitimate but others are arguing that it should have raised alarms inside GSK and at its external auditor PricewaterhouseCoopers. Notwithstanding the valuable contributions, only about 5 percent of MSMEs has access to capital from the organised financial sector according to statistics compiled by the Ministry of MSME. We must adopt simple procedures for raising capital or when going in for equity listing. MSME sector was classified as priority sector lending (PSL). Banks were allowed to include the amount in their commitment to lend up to 40 percent of their total loans to national priorities like agriculture, MSMEs, exports etc. as mandated by the RBI. In 2011, the rules were changed and banks are no more allowed to route their priority sector commitments through the NBFCs. Instead, they are required to lend directly. A practical consequence of the change is that banks now have less incentive to lend to the NBFCs and this, in turn, has negatively affected the flow of credit to the MSMEs. The paradox is that a measure that was meant to compel banks to lend directly to MSMEs and thereby put more money into their hands has, in practice, led to the opposite. NBFCs have been forced to cut down on their lending to MSMEs while banks are yet to gear up to the challenge. institutions) is a welcome initiative but we need more of such agencies. We need greater awareness among MSMEs and bank officials of the existence of such ratings. We should also consider setting up more specialized lending institutions on the lines of SIDBI, NHB etc. We must adopt simple procedures for raising capital or when going in for equity listing. Finally, more stock exchanges have to be established that would list MSME shares along with a separate capital market regulator overseeing separate regulations that would make it easier for MSMEs to raise equity. No doubt there is a long way to go but keeping in mind the transformation that a thriving MSME sector can bring about, it is imperative that the efforts begin now. verlooking the beautiful backwaters of Cochin you have Dr Thomas Nechupadam’s office. Even though the office is situated in the heart of the city, it is fathoms away from the din and the bustle. The serenity inside the office is further accentuated by the warm welcome extended to me by Dr. Thomas. Without wasting anytime on formal conversation, Dr. Thomas was updating me about his journey so far. He hails from Family of Doctors where almost all members are acclaimed dental practitioners. Dr. Thomas as a sought after dental practitioner who remains busy most of the time. Dr. Thomas however moved beyond his call of dentistry to a more holistic approach. He believes that the smile originates from the heart and the individual need to be fully transformed to bear a beautiful smile. Thus a beautiful smile is symbol of confidence and success. As the head of Metanoeo, he transforms individuals by assisting them on their grooming, dressing and social etiquette. He trains young participants in coveted beauty pageants like Miss South India and Miss Queen of India. Dr. Thomas has proved himself as a successful entrepreneur and a leader who occupies various positions in industrial and commercial bodies. He is currently the director of Kerala Chamber of Commerce and Industry. He has also proven himself as writer and he writes on a variety of topics. Excerpts from the interview. writing is a great exercise to streamline your thoughts before you actually implement it. I stand by the values that made me, that include honesty, commitment and hard work. So in whatever I do I try to deliver my hundred percentages. Another side always check is for the inherent value in the process. All the stakeholders including the society must benefit from whatever I do. So to answer you my diverse roles challenge me every day to perform to my best. Tell our readers more about Metanoeo ? The name Metanoeo comes from two Greek words Meta and Noeo. Meta means change and Noeo is Knowledge. The word then essentially means the change that happens after you acquire knowledge. Metanoeo is a 360 degree grooming company which aims at complete transformation of an individual. 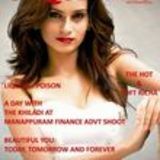 We are the official personality groomers for beauty pageants like Miss South India and Miss Queen of India. We do corporate training, and also do training for students in professional colleges. a lot of fulfilment when I see a smiling face standing up from dental chair. I am committed to acquire the latest technology into my clinic, so my patients get the best treatment available in the world at an affordable cost. I am also very particular about the sterilisation and disinfection protocols and I keep the parameters at international levels. I also have good clientele of foreign nationals as my clients. May be you can call it dental tourism. Dental Tourism? It is a not so serious word coinage but the reality is that dental care expenses are very high in western countries. For example a simple root canal treatment will cost you up to 800 dollars in the US. Here it may cost less than 100 dollars. So if somebody has to undergo two root canal treatments in US, they may as well come to India, undergo go the treatment and with remaining amount they can enjoy a holiday here. Isnâ&#x20AC;&#x2122;t it great proposition? Yes certainly, like medical tourism? I have a different take on that, once you have a medical condition it is very difficult to enjoy a holiday. While the expenses are very less in India, the patient however will need extensive rest, medication and frequent check ups. You may term it as medical travel. But when it comes to dental treatment you can very well enjoy your holiday and take home a smile. You are part of several industrial bodies and business associations? I am a Director with the Kerala Chamber of Commerce and Industry, I am part of CII. Young Indians, the Kerala Management Association, The Indus Entrepreneurs(TiE) and the BNI. I am also part of the Middle East Broadcasting Corporation What are your future plans? Our family was into agriculture and farming, two generations before. My grandfather was a farmer. I have a great interest in developing a farm and I always liked farming. Recently I have started a goat farm. I am currently in consultation with a company from Germany called Germany GEA-WEST FALIA SURGE for starting dairy farm in Kerala. On the dental front, one of my dream projects is a Dental Tourism Spa. I had a spa in one of the deluxe resorts in Cochin. Now I am in the process of starting a Dental Tourism Spa in one of Kochiâ&#x20AC;&#x2122;s finest hotels. About your family, is your family supportive of your plans? I like to spend my free time with my family. That helps me to relax a lot. I also like reading books and travelling. You have been associated with Unique Times for long, what is your feedback on the magazine? I have been associated with Unique Times, right from the first edition. Initially I used to write a column based on the queries I got as a doctor. I really enjoyed that. 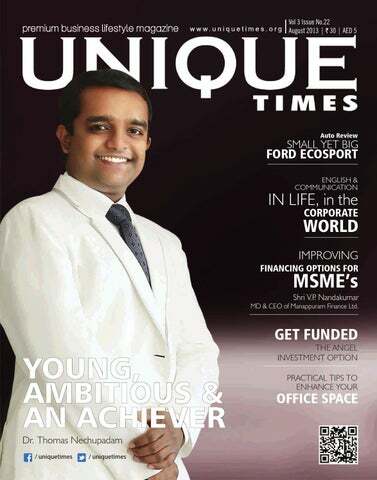 Unique Times at the same time was evolving into a business lifestyle magazine, now I write mainly on entrepreneurship and developing entrepreneurial skills. I feel that that magazine is on the right track and as we go forward we will compete with International magazines. My family is very supportive and without which I will not be able to do anything. My wife Dr. Nithia Nechupadam, who is also a dentist by profession, is the power behind all my efforts. We are blessed with three children, Nissi, Nidhi and Noah. My father Dr. K T Paulose Nechupadam, ( Senior Orthodontist) and my siblings are all dental practitioners, so that I get a lot of support from their side in all my efforts. What are you hobbies, how do you spend your free time? I like to spend my free time with my family. That helps me to relax a lot. I also like reading books and travelling. I write extensively in the Social Media. I am devout Christian and I am blessed immensely by listening to the word of God. I am currently learning music. he first-generation EcoSport was initially designed and engineered in Brazil for Brazil. The latest avatar will be exported all over the world and India being one of the first markets it will be launched. The appeal of the car is great and the car looks very attractive. The Ecosport offers a really great drive. The car comes in three engine options, a 1.5 diesel, a 1.5 litre petrol and a direct-injection turbo petrol motor the 123bhp 1.0-litre EcoBoost. The 1.5 petrol versions get an option for twin-clutch automatic gearbox. The all-new 1-litre EcoBoost petrol engine can be called the highlight of this Ford. And it puts out 123bhp, which is amazing for small engine. The EcoBoost petrol engine gives 18 kmpl which is actually outstanding for petrol engine that gives so much power. In India Ford EcoSport is a runaway success and it has raked in more than 30,000 bookings in a short span of time. Ford has retained most of the design features from the concept. The kinetic design philosophy is retained. The big hexagonal grille with a lot of chromed splashed gives the car a dominant look. Looks Ford has retained most of the design features from the concept. The kinetic design philosophy is retained. The big hexagonal grille with a lot of chromed splashed gives the car a dominant look. The headlamps are very contemporary but relatively small when compared to the grille and may go unnoticed. The rear design is centred on the spare wheel or it looks like that. The tail lamps are well designed. The upper half of the left tail-lamp on the tailgate houses a part of the tail-lamp, while the right side houses the handle for the tailgate. The EcoSport look does not appeal from the side view. The shortness of the car is evident from the side view. Interiors Most of the interior are taken from the interior design of Ford Fiesta sedan. The seating is very comfortable. There is premium upholstery in the top end versions. The dashboard looks like the one in the international fiesta. The quality of the plastic is good. The cool ice Blue back light illumination in the analogue dials is brilliant. The top end of SUV has got an adjustable driverâ&#x20AC;&#x2122;s seat, there are quite a few storage spaces inside the cabin and that can be quite handy. computer, front fog lamps, a 12V power outlet for rear passengers In the exterior visual enhancements setting the Titanium variant of the EcoSport apart from the Trend variant are its chrome front grilles, silver roof rails and 16-inch alloy wheels. In the inside the EcoSport Titanium is distinguished from its lesser variants by the leather wrapped steering wheel and manual gear knob, driver's arm rest, adjustable lumbar support and front sunglass holder. There is additional safety features on the EcoSport Titanium will include front airbags, rear parking sensors, emergency assist, and a configurable speed alarm. The automatic variant of the EcoSport available in Titanium trim only will pack in equipment such as side and curtain airbags, traction control, hill hold function, stability control and electronic brake assist and front tweeters. tall gearing blunts responsiveness to some extent. Power delivery is largely linear and thereâ&#x20AC;&#x2122;s no sudden surge when the turbo kicks in, which makes the EcoSport easy to drive in traffic. Flat out, the diesel hit 100kph in 13.7sec, which is again quite impressive, but itâ&#x20AC;&#x2122;s the long-legged cruising ability that makes the EcoSport diesel a good long-distance companion. 1.5 LITRE PETROL The 1.5-liter Ti-VCT (twin independent variable camshaft timing) petrol engine of EcoSport makes 1499cc of displacement. It generates a power of 108 bhp at 6300 rpm and the maximum torque produced is 140 Nm at 4400 rpm. This engine also has option for the 6-speed automatic transmission. This engine gives an average mileage of 15.6 kmpl on the highways. 1.5 LITRE PETROL AUTOMATIC The 6-speed Power Shift gearbox uses a twin-clutch setup which leads to very quick shifts with the petrol motor giving the vehicle decent performance. Apart from than the normal P, R, N and D modes, you also have S mode, where the transmission becomes more eager and shifts very quickly, taking the vehicle to redline every time. The Power Shift auto box up shifts seamlessly but is not so eager to downshift and you really have to give the throttle the beans to move quickly at times as the TiVCT engine needs to be on the boil for quick progress. The 1.0L EcoBoost engine delivers a fuel efficiency of 18.9 km per litre, 1.5 litre diesel engine delivers an efficiency of 22.7 km/L and the 1.5 litre petrol automatic variant delivers a fuel efficiency of 15.8 kms per litre, claims Ford India which is pretty impressive when compared with competitors. Ecosport will take on Mahindra & Mahindra's Quanto, Maruti Suzuki's Ertiga, Renault Duster and it will also try to wean away premium hatchback Hyundai i20 and prospective compact sedan customers of Maruti Suzuki Dzire and Honda Amaze. WagonR Stingray Maruti Suzuki is all set to launch the sportier version of the Wagon R, which will be called the WagonR Stingray. The Stingray edition will be placed above the current offering. Suzuki has already rolled out this model in the Japanese market. The company is reportedly doing this exercise to rejuvenate the Wagon R brand in India, which is almost 14 years old. The stingray edition will be more have a sportier look with a slimmer grille and flat bonnet. The pictures that are available shows that the car has got projector headlamps. Alloy wheels are also part of the package. The WagonR Stingray is expected to carry the same threecylinder 67bhp 1.0-litre K10 series motor as seen in the current WagonR. The Stingray to be priced around Rs. 40,000-50,000 priced more than the current WagonR. The car is said to be launched during the festive season later this year. BMW i3 German luxury car maker BMW Group launched the first production series of its all-electric ‘i3’ city car simultaneously in Asia, Europe and the US. The company sources said that that they sees huge potential in India for the BMW i3 and is in talks with the government on the issue of sustainable mobility. The i3 would will be available in the London market by the end of this year and in Beijing and New York from the beginning of 2014. While it will be priced 35,000 euros in Europe, the i3 will cost $41,350 in the US. The company has not yet decided price for the Chinese market. When asked about the company has plans to launch the i3 in India, the Group’s Board member for production Harald Krueger said: “I was in New Delhi last week. We have discussed about this with the concerned minister. We will definitely come to India as we see there is a potential market. But we cannot say when (i3 will be launched in India).” The infrastructure in India for such electric vehicles has to be developed first, he added. Mix one tablespoon of honey and 2 tablespoons of fresh cream. Apply this mixture on the face and leave it for a few minutes. Wash your face with cold water. It will work wonders. To make your skin glow Grate a fresh coconut and squeeze milk out of it. Apply it on your face, neck and hands. It will add glow to your skin. Cleansing the skin Take some fresh milk and dip cotton in it. Wipe your face with the cotton. This procedure will take out even the unseen dirt. Mix one tablespoon of honey and 2 tablespoons of cream. Apply this mixture on the face and wash off after a few minutes. It works wonders. Removing skin pigmentation and marks Slice a fresh potato and rub it on your face. Rub it on your face for removing skin marks. he days when Indians considered English the colonizerâ&#x20AC;&#x2122;s language are perhaps nearly over. However, there may still be many who believe that English is a strange and unpredictable kind of language. For instance, it is a language in which there is neither pine or apple in pine apple; the nose can run and feet can smell! Father is pop, but mother is not mop! It confuses one further when one thinks that a vegetarian eats vegetables and wonders what a humanitarian eats! In spite of all these, English is the language that makes communication possible among millions of people who do not share a mother tongue. It is because of this that English is considered lingua franca (a unifying language, bridge language, vehicular language, or working language). knowledge, and easier communication with the entire world. Understanding the nature of communication is as important as understanding the importance of the medium. The word communication is derived from Latin "communis," which means “to share.’’ It indicates the activity of conveying thoughts, messages, or information, by speech, visuals, signals, writing, or behavior. (Human communication can be defined as the process of transmitting information, ideas and attitudes among people. It is the process of meaningful interaction among human beings. The primacy gained by English makes it the most effective medium of interaction among peoples across the continents. This in turn explains the growing preoccupation with English communication, and the growing importance of English in the corporate world. How do we identify good communication skill? On what basis do we judge a person’s communication skill? Is it based on effectiveness for purpose, or the impression created by the person? Perhaps good communication skill involves both. We can say that effectiveness in communication can be measured by the message communicated, its quality, clarity, and impact. individual’s　communication，　though　it　may　not　often　appear　among　corporate　concerns．　The　effective　use　of　communication　skills　within　the　family　can　be　the　basis　of　proper　understanding　between　its　members　and　successful　life　together．　Best　practices　in　communication　in　the　corporate　world　can　offer　lessons　in　better　communication　within　the　family，　as　it　can　happen　in　the　reverse　manner　too．　It used to be said that it is love that makes the world go round, with different possible meanings and contextual implications for the word love. It could almost be said, in a similar spirit, that it is communication that makes the world go round. This applies to life in the family as it does to life in the corporate world. Angel investors are often retired entrepreneurs or executives, who may be interested in angel investing for reasons that go beyond pure monetary return. Angel investments and are usually subject to dilution from future investment rounds. As such, they require a very high return on investment. the potential to return at least 10 or more times their original investment within 5 years, through a defined exit strategy, such as plans for an initial public offering or an acquisition. There is no â&#x20AC;&#x153;set amountâ&#x20AC;? for angel investors, and the range can go anywhere from a few thousand, to a few million dollars. Angel investors are often retired entrepreneurs or executives, who may be interested in angel investing for reasons that go beyond pure monetary return. These include wanting to keep abreast of current developments in a particular business arena, mentoring another generation of entrepreneurs, and making use of their experience and networks on a less than full-time basis. Thus, in addition to funds, angel investors can often provide valuable management advice and important contacts. Because there are no public exchanges listing their securities, private companies meet angel investors in several ways, including referrals from the investors' trusted sources and other business contacts; at investor conferences and symposia; and at meetings organized by groups of angels where companies pitch directly to investor in face-to-face meetings. When angel investors participate in a business it is more like they starting a venture afresh. In the initial times of this investor classes they participated in a known person's venture. As angel investors are mostly single individual it brings limitation such as they look for locally based companies for proximity of reach, they bring in their or money and hence demand higher return compared to other investors and they actively participate n the operations of the business. he Jaguar F-Type is a two-seat sports car, based on a shortened platform of the XK convertible. The F-Type was developed under the project code "X152". A similarly sized concept car, the C-X16, was shown at the Frankfurt Motor Show in September 2011. The car was launched initially as a soft-top convertible, with a coupe version expected to be launched in 2014. The entry-level F-Type uses Jaguar’s new 3.0-litre V6 supercharged petrol engine, good for 340 PS (250 kW; 340 hp), 0 to 60 mph (0 to 97 km/h) in 5.1 seconds, and a top speed of 161 mph (259 km/h). In the middle comes the F-Type S, with the same engine tuned for 380 PS (280 kW; 370 hp), a top speed of 171 mph (275 km/h), and 0 to 60 mph in 4.8 seconds. The top of the range model is the V8S, with Jaguar’s 5.0-litre, 495 PS (364 kW; 488 hp) supercharged petrol engine. The layout is front-engine, rear-wheel-drive. The gearbox is an eight-speed automatic with paddle-shifters offering manual override. There is a mechanical limited-slip differential on the V6 and electronic limited-slip differential on the V8. Jaguar has introduced a stopstart engine shutoff function, which Jaguar claims boost economy by 5 per cent. The F-Type has bi-xenon headlights with integrated LED daytime running lights, along with full LED lighting at the rear. The S and V8S versions get an “active exhaust system” which opens special valves over 3,000 rpm to intensify the sound profile. There is a retractable rear wing spoiler and door handles that are left hidden with the bodywork until needed. The fabric hood raises or lowers in 12 seconds, and can be used when the car is moving at up to 48 km/h (30 mph). The audio systems offered, use Meridian technology with either 380 W spread across ten speakers or 770 W across twelve speakers. Jamaica is Portia Simpson-Miller. Jamaica is a parliamentary constitutional monarchy with legislative power vested in the bicameral Parliament of Jamaica, consisting of an appointed Senate and a directly elected House of Representatives. Jamaica, as a former British colony, drives on the left. Make note of this when driving, especially when turning, crossing the street, and yielding right of way. There are relatively few stoplights outside of urban centres; they are generally found in major city centers, such as Montego Bay, Falmouth, Kingston, Mandeville, Spanish Town and Ocho Rios. For towns where stoplights are not installed, roundabouts are used. Renting a car is easily done, and it is advised to go through an established major car rental company such as Island Car Rental, Hertz or Avis. Do your research before renting and driving. Glass-Steagall Act: An act the U.S. Congress passed in 1933 as the Banking Act, which prohibited commercial banks from participating in the investment banking business. The GlassSteagall Act was sponsored by Senator Carter Glass, a former Treasury secretary, and Senator Henry Steagall, a member of the House of Representatives and chairman of the House Banking and Currency Committee. The Act was passed as an emergency measure to counter the failure of almost 5,000 banks during the Great Depression. The Glass-Steagall lost its potency in subsequent decades and was finally repealed in 1999. Blue Collar Trader: A trader who has another source of income, and does not trade as a means, but rather as a savings plan, or bonus, etc. This person typically does not trade in large volumes, leaning more towards trying to earn smaller returns. Such a trader is not significantly experienced or knowledgeable in the field, and will therefore tend to stick to less risky investments. Andrew's Pitchfork: A technical indicator that uses three parallel trendlines to identify possible levels of support and resistance. The trendlines are created by placing three points at the end of identified trends. This is usually achieved by placing the points in three consecutive peaks or troughs. Once the points have been placed, a straight line is drawn from the first point that intersects the midpoint of the other two. Paid-Up Capital: The amount of a company's capital that has been funded by shareholders. Paid-up capital can be less than a company's total capital because a company may not issue all of the shares that it has been authorized to sell. Paid-up capital can also reflect how a company depends on equity financing. usiness leaders all over the world are talking about India and its emerging market. But, the web of bureaucratic red-tapism and uncertainty has reduced India’s appeal. But even then, the challenges that India poses cannot deter from the fact that it is indeed a populous market and a fast growing economy with enormous potential. Therefore, Venkatesan in Conquering The Chaos: Win In India, Win Everywhere sets out a couple of home truths about the market and how to tackle the same, in a manner that can help multinationals in tackling emerging markets everywhere. Venkatesan exposes the modus operandi that is used by most multinationals in dealing with the Indian market, which involves replicating products and services from their businesses elsewhere, as they consider India just another market. However, the author clearly warns multinationals from applying this very approach as they stand to lose a much bigger market in their bid for measly sales. page-turning cops and robbers story set against the backdrops of Silicon Valley and Wall Street.? ? Adam Lashinsky, bestselling author of Inside Apple: How America's Most Admired-and Secretive-Company Really Works. The collapse of the Galleon Group ? a hedge fund that managed more than $7 billion in assets ? from criminal charges of insider trading was a sensational case, at the centre of which was the self described King of Kings, Galleon?s founder Raj Rajaratnam, a Sri-Lankan-born, Wharton-educated billionaire. But the most shocking allegation was that the eminence grise of Indian business, Rajat Kumar Gupta, was Rajaratnam's accomplice and mole. It was Gupta's nose-to-the grindstone rise to the helm of McKinsey & Co. that opened up new opportunities for Indians in Amerca. Born in Calcutta and orphaned at fifteen, Gupta blazed a trail from Delhi?s hyper-competitive Indian Institute of technology through Harvard Business School to the inner sanctum of corporate America, serving on the boards of Goldman Sachs, American Airlines, and Procter & Gamble, and counting President Bill Clinton among his many powerful friends. lot of people are beginning to turn their attention to investments to supplement their income, to increase their wealth, and to build up good financial assets for a secure future. However, most investors are unsure on how to build a good investment portfolio. They require some advice and guidance on what to invest in, how to draw up an investment plan and other such concepts. Think, Act And Invest Like Warren Buffett is meant for the person who is just beginning to learn about investing. It is also for the investor with some experience, who would still like some more information to streamline their planning and portfolio. This book does not teach a person how to become Warren Buffett. Instead, the author uses Buffett’s advice and principles on investing to help the reader. The author uses Buffett’s fundamental advice to investors and elaborates on those points. rom the bestselling authors who taught the world how to have Crucial Conversations comes the new edition of Influencer, a thought-provoking book that combines the remarkable insights of behavioral scientists and business leaders with the astonishing stories of highpowered influencers from all walks of life. You'll be taught each and every step of the influence process--including robust strategies for making change inevitable in your personal life, your business, and your world. Influencer takes you on a fascinating journey from San Francisco to Thailand to South Africa, where you'll see how seemingly "insignificant" people are making incredibly significant improvements in solving problems others would think impossible. You'll learn how savvy folks make change not only achievable and sustainable, but inevitable. You'll discover breakthrough ways of changing the key behaviors that lead to greater safety, productivity, quality, and customer service. rom the corporate executive to the street vendor, everyone wants financial security, wealth and affluence. But, the author feels that most people are so lost in getting the wealth that they forget to live their lives. In From The Rat Race To Financial Freedom, the author takes his own life as an example to illustrate how everyone gets lost in the mad race to earn a living, to acquire wealth, and to ensure financial security for themselves and their family. In the process, they miss most of the things that they earn the money for in the first place. They lose touch with their family, fail to relax and enjoy the simple things in life, and get stressed out. The author says that he travelled the same route for years as a corporate executive worrying about his finances before he realized that in order to achieve what he wanted, he had to get out of the rut he had placed himself in. The author decided to take control of his own finances. He points out that it is not how much a person earns that determines their affluence and financial security. It is how much they save and invest that matters. onely at the Top is about leaders and the challenges they face as they walk alone. This edited anthology contains the reflections of a seasoned Mentor, on the leadership dilemmas of the CEO in a turbulent and unpredictably changing world. With examples and experiences, the author indicates, sometimes subtly and at other times, forcefully, the tools, mindsets and approaches that enable leaders to steer their organizations safely through dangerous times. Many Indian CEOs also suffer from cultural schizophrenia, whether acknowledged or not a crisis of identity stemming from the differing dialectics of modern Western business culture and Indias own rich, philosophical heritage. Using real experiences as telling case studies, the book demonstrates the value of anchorage in the spiritual ethos of India, and especially in the ambrosial mentoring of Arjuna by Lord Krishna, on the eve of a primordial conflict that has much in common with the inner conflicts in the minds of todays decision-makers. usic is something which releases a peace of mind within our body. Whether it be Indian classics, Bollywood, R&B, western classical, or even the opera or the latest in the mainstream like Bruno Mars, or Adele. Music makes you move without even knowing it. So why am I talking about music? It’s all about dancing my dear readers! Dancing your heart out till you feel like all your energy is drained from your body. This isn’t the usual fitness article for what you would consider for tips for working out in a proper manner to lose weight or simply keep fit. When it comes to music, it makes your body move to the beat, and when you start dancing, you’re giving into the energetic rhythms in your body which will help you to not only sweat out all the weight, but keep your energy in a balanced state physically and mentally. It’s all about how you perceive it. There is no such thing as being too old to do anything. include ballet, contemporary dance, salsa, the tango, break dancing, or even the classic waltz. Each dance though serves a particular benefit for the body helping to keep it toned in one way or another. Have you ever noticed that belly dancers no matter how old they are have a very toned body? It is because belly dancing takes control of the belly fat helping it to be shaped properly while controlling the lower abdomen fat. Dances such as contemporary dance stretches your muscles are it will have you moving in every way which will help you tone your lower body as It burns your calf, abdominal and thigh fat as well as keeping your buttocks toned. Ballet dancers are known to be very flexible as it bends all your muscles. Flexibility is something which is only developed out of practice. There is also the beautiful rhythmic salsa or the tango which is highly recommended for couples where they get to not only spend time with each other, but also learn the art together all the while having fun. So husbands and wives instead of nagging each other to get out the running shoes take each other out dancing and help each other keep fit and healthy! For those who do not enjoy these types of dances and prefer to stick with the classics, it’s never too late to take up bharatanatyam, kathak, Manipuri dance, or even Rajasthani folk dance as these dances will help you to keep fit overall as it requires your entire strength. When you look from afar, the dancers make the movements seem so simple, however just bringing your feet to the ground to make such a sound is more difficult than it seems, and it takes dedication and practice. With all your energy in cooperated into learning the dance, you won’t even be aware that you are working out, or burning so many calories. Dancing is an art which transforms you into another world, as each and every body movement stands to be a symbol for communicating parts of the story through the particular dance form, and if you are an admirer of the arts as well as someone who is seeking to keep fit without the mental burden of having to get up every morning to go for a run, look for dance classes in your area and take up dancing. There are some scientifically calculated dimensions for comfort & conveniences. This includes height, dimension of table’s chairs and other furniture’s. Understanding the planning, the layout and the process. The most important element of office is design. With an intelligent design even small spaces can be made comfortable. There should be sufficient area to move considering the number of occupants. In buildings with more height mezzanine floors have worked as a good option. Make sure that you understand the process and who is responsible for each task. There are many interdependent and overlapping duties that need to be identified and cleared upfront. You also should understand the time required for completing each task. Understand the Ergonomic standards There are some scientifically calculated dimensions for comfort & conveniences. This includes height, dimension of table’s chairs and other furniture’s. Not all furniture’s purchased follow the ergonomic standards. The awareness regarding these standards and benefits is crucial and the unknown benefits of this element of design play a huge role. Ergonomics standard can be considered the back bone of design. A good brief is essential for the success of any project. As well as your obvious requirements, it should also address issues that might be important to the business. Elements that gives life to a space. Plants, aquarium, water bodies etc add life to any space/ keeping it more lively/ Natural plants can be hard to maintain though/ Need to located at a no nonsense area or can be tampered with. Understand the safety aspects. Consider the safety aspects of your office space that includes the positioning of fire extinguishers, sprinklers, smoke detectors and exit signs. Also consider things like non-slip floor surfaces, first aid equipment, and the placement of any glass in relation to work areas. Understand your branding. Having a sleek, dynamic and forward thinking online presence may conflict with your outdated furniture in your physical presence; this can provide conflicting messages to your clients about your brand and image. Use the colours in the office to help strengthen your branding message as much as possible. Take into consideration walls, partitions, furniture, and doors; using advertisements as artwork. their English being weak, whatever reasons they may have, their lack of communication especially to their colleagues and their boss will make them lag in the work place. So how can you effectively communicate? Firstly clarify yourself on the matter that there are many types of communication. I am going to just go into the broader based view here just for a second. As an employee or even as a CEO of the company I am very certain that you are well aware that from the way you walk, to the way you sit to how you wear your tie or suit, down to the way you speak or look at an individual will communicate certain messages. So keep in mind that communication does not just occur through plain and simple speech. It occurs in many ways just as well. So now jumping onto how to communicate effectively with your colleagues or your boss, or vice versa where the boss needs to effectively communicate a message to the colleagues. Learn to sit and stand properly! So many people slouch, and are very much unaware that slouching gives an impression of laziness and it is as if you are hiding away from those around you. When you are presenting something before your teammates remember do not fidget and stand properly and speak loudly with a clear tone of voice yourself straight with your chest up and body straight. Don’t play with your fingers or your hands, but rather keep them still. Only little children play with their nails, biting them, scraping their nail polish off. Do not bring in such childish habits into the office place. Even if your boss is doing it, that does not mean you can. Learn to be proper ladies and gentlemen. Men, even women also note your handshake is also communicating to your boss of your confidence. That doesn’t mean go and squeeze the life out of your bosses’ or co-workers hands, it just means shake in a confident firm manner. Again note this point down don’t be clumsy with the handshake, it is first impression next to your appearance. When you are presenting something before your teammates remember do not fidget and stand properly and speak loudly with a clear tone of voice. Do not shift your weight now and then so much that it becomes notable. Fidgeting and constant shifting is distracting to your co-workers as they will become focused on that rather than your presentation. I’ve mentioned so far what the employees need to do, but to the dear bosses of these employees, please note down that however it is you got to the position where you are now, you are there because you earned it of course. word to use over friendly when it comes to the way you are with the employees as you want to communicate the message that they as your employees will learn much being under your leadership. Just always note whether you are an employee or a boss, just because you speak in a confident manner will not mean that you are communicating effectively, You have to dress and act the part as well. And if you are not confident to speak up due to your lack of knowledge in the language please learn to put aside that fear, as it will get you nowhere, and you need to get somewhere, because isn’t that why you spend all your life trying to get to where you are now? So stand straight, be proper, and speak up. vernote Business helps you to break down communication barriers between corporate departments. This free flow of information helps in collaborative problem solving, which enables faster solutions. Evernote Business also makes it easier to incorporate customer feedback to influence strategy. Evernote Business easily integrates with your existing Evernote account and grants you access to Evernote Premium. With a Premium account, you get access to 2 GB of personal memory a month, and your company gets an extra 2 GM to share in Business Notebooks. ynamics Business Analyzer is a free CRM app from Microsoft. The app requires Windows 8 or Windows RT to run. The app has got colourful metrics dashboard so you can copy, edits, view and refresh reports directly on your desktop. You can easily customize which reports you want to include on the dashboard, ranging from gross profit reports to sales per month reports. This app integrates with the Windows 8 edition of Lync so that coworkers can collaborate directly on the reports. alendar management is an emerging topic where several apps are created. One of such app is Tempo. Tempo is a calendar management tool that pulls in contextual information about your daily events from contact information to driving directions. Tempo generates a daily schedule that you can preview either in calendar or list view. Even though, Tempo is not specifically targeted toward businesses, but it can be especially helpful for pulling in email information about meetings or corporate events. The app comes with built-in Foursquare and Yelp integration, so locating your meeting is painless. low is an app which makes project management incredibly easy and collaborative. Flow has got a clean, simple design, however, brings peace of mind to task management. Plan a project by creating a folder, adding in lists for each project component and writing in an itemized task for each list. Delegation of tasks is easy; you can send the task to co-workers via email, even if the person you're delegating the task to doesn't have a Flow account. The activity log helps everyone involved in a project see when someone is assigned a task and when someone completes it. Integrate search keywords to expose your news to those who are searching for similar content. You will have to use your keyword research to drive trends press releases, by- line articles and blog posts, and learn how to correctly integrate keywords into each piece of writing for maximum impact. integrate it everywhere. In your press release, your face book page description in the slide share presentation. Digital PR thus is combination of content marketing, search and social with traditional PR that will allow users to take their stories out of their newsroom and broadcast it to the street, to the neighbourhoods and your network. The faster you integrate your digital content management and other SEO Activities with your PR, the faster you will win and retain your customers. Big News: A Bloomberg report suggests that Facebook is planning to add new 15-second “TV-style commercials” to its News Feed. The new ads will be launched to the end of this year and will be priced at a whopping $1 million to $2.5 million for one day. This will give Facebook a new revenue stream to add to its social network. In April AdAge reported that Facebook was in search for a new ad product to take around to advertising and other digital agencies. With this report, it's confirmed that is what the world’s largest social networking company is planning for. A $2.5 million per day price will create a huge boost for Facebook’s bottom line. Unique Times E mag august 2013. It is a premium business life style magazine.